Greenfield's Kaelyn Wall (13) goes up for a layup as Wayne Country Day School's Jala Holloman (4) tries to stop her in the third quarter of the Coastal Plain Independents Conference tournament championship game Friday night at Greenfield. Wall put in 10 points in the 65-23 loss as she earned all-conference and all-tournament honors. Greenfield's Serenity McNair (2) goes up for a jumpshot in the third quarter of the Coastal Plain Independents Conference tournament championship game Friday night at Greenfield. McNair put in 8 points in the 65-23 loss Friday night as she took home all-tourney and all-conference honors. Greenfield's Jeallen Holland (20) goes up for a jumpshot against Wayne Country Day School during the Coastal Plain Independents Conference tournament championship game Friday night at Greenfield. 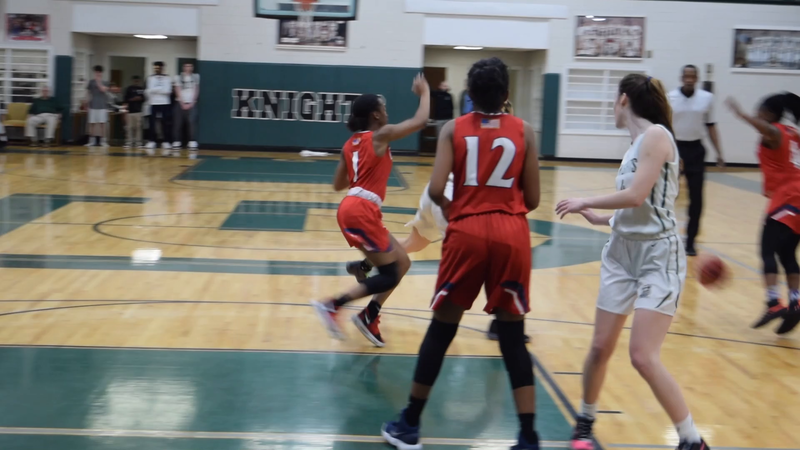 The host Greenfield School girls varsity basketball team knew Friday’s assignment was a tough rock to push up the hill — facing the reigning three-time 1-A/2-A Coastal Plain Independents Conference regular-season and two-time tournament champion Wayne Country Day School. And the Lady Chargers rolled over the Lady Knights like a boulder from the beginning to win 65-23. Greenfield head coach Bruce Wall said his team would need to play perfect and for WCDS to play poorly, but neither happened as the No. 1 seed Lady Chargers jumped out to a 16-2 lead in the first five minutes of the game. WCDS (20-2) was too fast and too strong for Greenfield (13-7). Wall asked for his team just to play hard and not play the score. “All I asked was for them to compete, act like it’s 0-0 every possesion and get prepared for the state tourney,” Wall said. Wall received a nice honor after the game when he and Lady Chargers head coach Maurice Jones split Conference Coach of the Year honors. Wall was happy that his peers see how much growth his team has done since the beginning of the season. Junior Kaelyn Wall led Greenfield with 10 points while seventh-grader Serenity McNair finished with eight points. Both Wall and McNair were named to the all-tournament team and were joined by Lady Knights senior Sumer Hassan on the All-CPIC team. Wayne Country Day School’s Jala Holloman, who netted 14 points, was named CPIC Player of the Year and tournament MVP. Teammate Lexi Jeffreys had a game-high 15 points and took home all-conference and all-tournament honors. The 1-A Lady Knights will not have to see 2-A Wayne Country Day in the North Carolina Independent Schools Athletic Association 1-A. And that’s a good thing considering the Lady Chargers outscored Greenfield by a combined 108 points in their three wins. By comparison, the Lady Knights’ other four losses, all out of conference, were by a total of 55 points. But those games against WCD helped prepare Greenfield for the state tournament. “If we can pressure the ball better, cut our turnovers out and, of course rebounding, that’s what we’re going to work on this week,” Wall said. McNair 8, Wall 10, Holland 5, Hassan, Stone. Jones 2, Barnes 8, Holloman 14, Brunson 13, Strickland 5, Tabe 2, Grimmen 4, Cox 2, Jeffreys 15.